If you’ve had a bad experience with a CPAP mask, don’t give up on the therapy entirely. You might have simply being using the wrong kind. There are a variety of masks available in different sizes and styles. Some have features such as humidifier settings and exhalation detectors. There are masks that cover most of the face and some that only cover the nose, mouth, and portion of the face. The nasal pillow mask is designed to sit at the nostrils. It doesn’t actually cover the nose and/or mouth like the other two. If you tend to breathe through your mouth while you sleep, a full face mask would be ideal. The most important consideration when choosing a good mask is your own personal preferences and needs. A full face mask might not be the right choice if you are claustrophobic. If you can’t stand the thought of anything touching your nostrils, you might want to avoid a nasal pillow. Each type of mask offers its own set of benefits. Talk these over with your machine supplier or doctor. 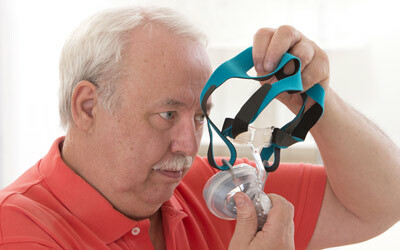 Since they come in different sizes, there should be at least one CPAP mask that fits your face perfectly. The idea is to achieve a nice, smug fit, without the mask being too loose or too tight. If it somehow gets knocked off your face in the middle of the night, you obviously won’t get any benefits from this type of therapy. If it doesn’t fit right, or you don’t have it adjusted properly, the mask could have a leaking problem. You don’t want any of the air pressure to escape. Check your instruction manually to ensure that you are fitting it correctly. In order to get a mask to fit properly is to achieve a stable seal so that no air leaks out. At the same time, you should feel comfortable. It’s time to get a different mask if the one you’re using leaks too much and feels uncomfortable when you tighten it. As mentioned above, some CPAP machines come with features such as humidifiers. Having air continuously pushed into your airways can lead to dry and irritated nostrils. Choosing a machine with a built-in humidifier with adjustable settings is a benefit if you are concerned about this problem. Another useful feature is exhalation pressure relief. This makes it easier for you to exhale against the incoming pressurized air by detecting your exhalation and automatically relieving the amount of pressure. It makes breathing feel easier. Heated tubing can be placed inside of the tubing that connects the mask to the machine to help keep the air at a constant temperature. This feature helps reduce condensation build-up inside of the tube. It’s recommended if your mask causes you to have a runny nose. These are some of the many features available with newer CPAP mask models. Having the right mask that fits perfectly on your face and provides you with the quality of air you need to help you sleep is extremely important.